I'm having a hard time deciding on the layout of my quote. I've tried a few different options, but none seem to fit the "personality" of the sentence to me. I made some attempts to use graph paper as a grid, and it definitely helps keep things much more even and proportionate than when I go without. I haven't spent any money on fancy pens or pencils yet, though. I wanted to practice with making swashes. I've never been good at flourishes, so this project is definitely forcing me to work on that skill. I got a comment from Grace that mentioned the "r" looked a bit like an "e" the way I was writing it before in my first sketch, so I altered its appearance by moving the loop to the side of the "t" instead of the "o." I also made a slant grid on this one below which I think helped a great deal. I feel like I'm so behind, and I probably am, but I am truly enjoying working on this! Please feel free to throw any and all criticisms so I can make the world know how much I hate cilantro with gorgeously illustrated letterforms! I've been fascinated with "making pretty letters" since high school, but it wasn't until very recently (11ish years later) that I became extremely passionate about learning more about hand lettering. I'm a graphic designer who has always been fond of page layout, and I never knew exactly why, but I've discovered that exploring letterforms is making me learn more and more about why I love what I do. I started exploring lettering more after a new friend of mine told me all about Jessica Hische. My mind was blown... If you had told me that I could make an entire meaningful and successful career out of hand lettering when I was in high school, my strict Filipino parents who wanted me to go to into medicine and I would have laughed in your face. 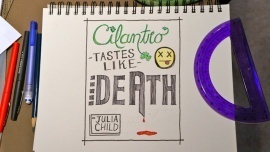 So my first big real attempt at hand lettering was to do this quote back in January about hating cilantro by the legendary chef, Julia Child. I'm not completely unhappy with it, but I know it could be SO much better. This was the beginning of my lettering learning journey, and I want to see it grow into something well thought out and professionally designed. I also want to force myself into becoming more comfortable with transferring my hand lettering into Illustrator, which is why I jumped at the opportunity to enroll in this class. I've been inspired by other hand letterers such as Sean McCabe and Dana Tanamachi... And now that I've found this class, I'm beyond thrilled to learn from Neil Tasker!! Thank God for the Internet...lol I can't wait to get started!